Hi guys, now I want to share with you on how to change the Tie Rod End and steering boot. First, jack and remove the front rim by removing the lug nut, refer here. If you are doing work at the right side of the wheel, turn your steering to the left, so that easy for you to get into it. Refer to the picture below in red circle, loosen this nut first before you start any work. Then remove the safety pin before you can remove the Tie Rod End nut (refer to the picture, a yellow arrow). 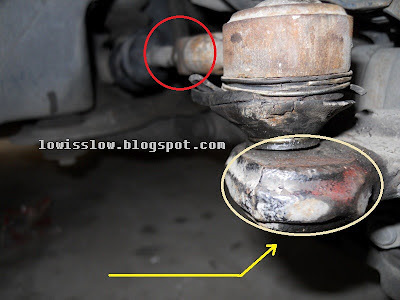 Spray WD40 to the circled area, it will help you to loosen the Tie Rod End. 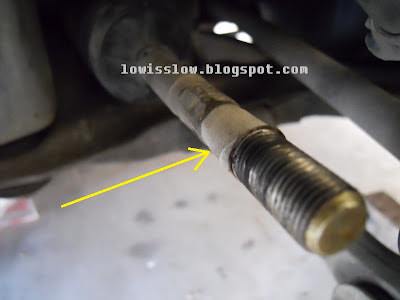 You need a hammer to knock the metal (in yellow circle) in order to take it out, or you can knock it from the bottom of the Tie Rod End (never do this if you want to recycle the Tie Rod End, as the thread will be damage). Before you remove the Tie Rod End, mark the thread first, (Im using paper tape, refer picture below) so that the wheel allignment will not different too much for you to drive to the allignment shop. In order to take out the torn steering boot, you need to cut the aluminium clip or cable tie at the both side of the steering boot. 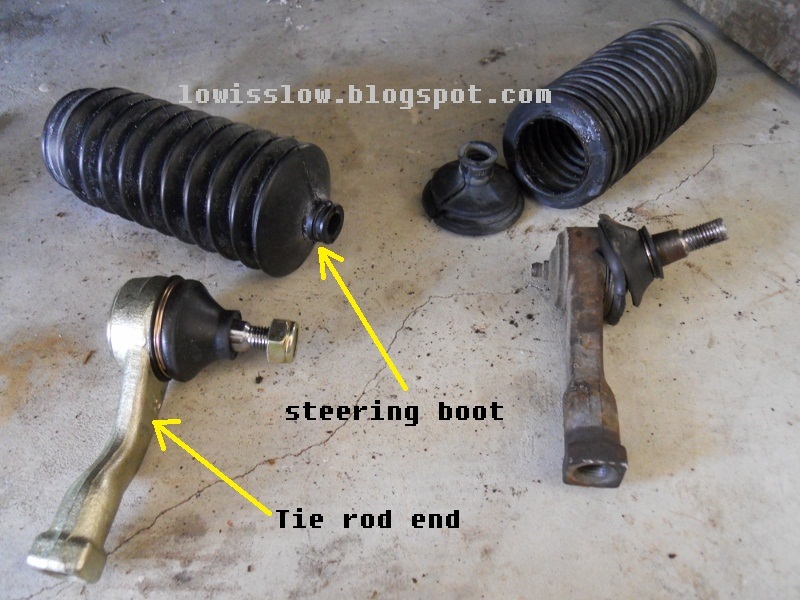 Once the torn steering boot removed, clean the ball joint and rub with heavy duty grease before installing a new steering boot. Remember to tie the new steering boot inner with cable tie. Maybe you should turn your steering wheel to the right to make your work easier. Now screw back the nut until it reached the mark you made before and then continue installing a new Tie Rod End. 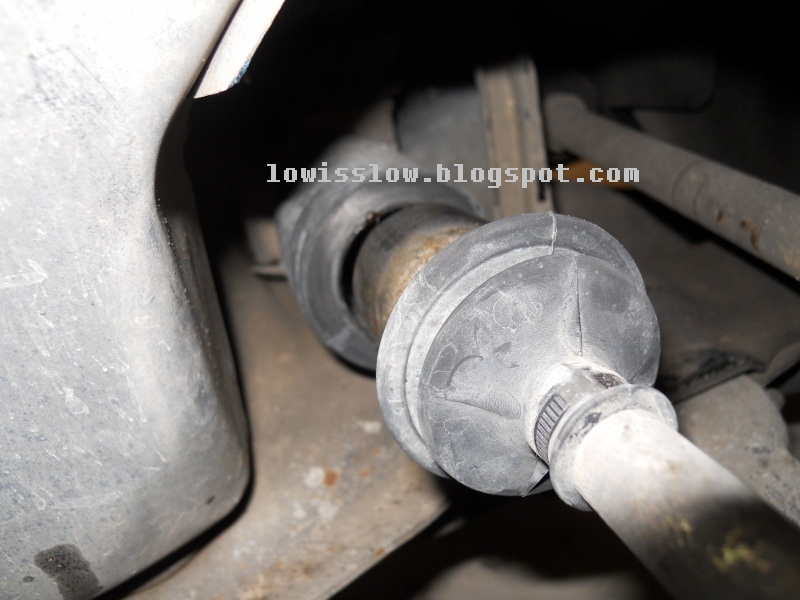 Screw back the Tie Rod End nut and remember to put back the safety pin into it place. 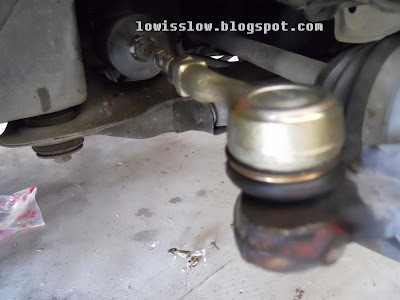 Make sure it tight enough as this thing (Tie Rod End) work to push or pull the wheel to the left or right whenever you turn the steering wheel. Otherwise, you will loose controll of your vehicle. Lastly, drive to the nearest wheel allignment shop slowly, as your car maybe will steer to the left or right without turning your steering wheel, so becareful.. Gud luck.. Note: This DIY project is not recommended for those who stay far away from wheel allignment shop. Exhaust Smoke. What Does It Mean?